The horse, dubbed by researchers as 'Titanium Prints', had its hooves scanned with a handheld 3D scanner this week. Using 3D modelling software, the scan was used to design the perfect fitting, lightweight racing shoe and four customised shoes were printed within only a few hours. 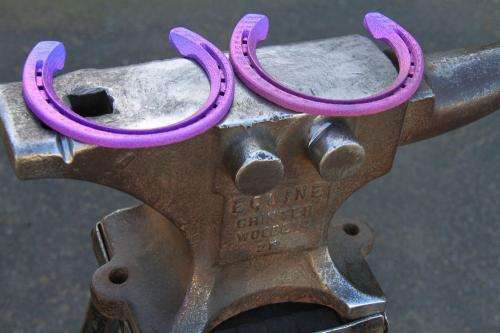 Traditionally made from aluminium, a horseshoe can weigh up to one kilogram but the horse's trainer, John Moloney, says that the ultimate race shoe should be as lightweight as possible. "Any extra weight in the horseshoe will slow the horse down. These titanium shoes could take up to half of the weight off a traditional aluminium shoe, which means a horse could travel at new speeds. "Naturally, we're very excited at the prospect of improved performance from these shoes," John Moloney said. CSIRO's Titanium expert, John Barnes, said that 3D printing a race horseshoe from titanium is a first for scientists and demonstrates the range of applications the technology can be used for. "There are so many ways we can use 3D titanium printing. At CSIRO we are helping companies create new applications like biomedical implants and even things like automotive and aerospace parts. "The possibilities really are endless with this technology," he said. The precision scanning process takes just a few minutes and for a horse, shoes can be made to measure each hoof and printed the same day.